For the mineral type, see chlorite group. For the neutral chemical compound, see chlorine dioxide. 2. A chlorite (compound) is a compound that contains this group, with chlorine in oxidation state +3. Chlorites are also known as salts of chlorous acid. An ion is an atom or molecule that has a non-zero net electrical charge. Since the charge of the electron is equal and opposite to that of the proton, the net charge of an ion is non-zero due to its total number of electrons being unequal to its total number of protons. A cation is a positively charged ion, with fewer electrons than protons, while an anion is negatively charged, with more electrons than protons. Because of their opposite electric charges, cations and anions attract each other and readily form ionic compounds. Chlorine is a chemical element with symbol Cl and atomic number 17. The second-lightest of the halogens, it appears between fluorine and bromine in the periodic table and its properties are mostly intermediate between them. 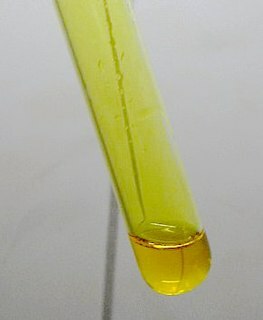 Chlorine is a yellow-green gas at room temperature. It is an extremely reactive element and a strong oxidising agent: among the elements, it has the highest electron affinity and the third-highest electronegativity, behind only oxygen and fluorine. The oxidation state, sometimes referred to as oxidation number, describes the degree of oxidation of an atom in a chemical compound. Conceptually, the oxidation state, which may be positive, negative or zero, is the hypothetical charge that an atom would have if all bonds to atoms of different elements were 100% ionic, with no covalent component. This is never exactly true for real bonds. Sodium chlorite is derived indirectly from sodium chlorate, NaClO3. First, the explosively unstable gas chlorine dioxide, ClO2 is produced by reducing sodium chlorate in a strong acid solution with a suitable reducing agent (for example, sodium chloride, sulfur dioxide, or hydrochloric acid). Sodium chlorate is an inorganic compound with the chemical formula NaClO3. It is a white crystalline powder that is readily soluble in water. It is hygroscopic. It decomposes above 300 °C to release oxygen and leave sodium chloride. Several hundred million tons are produced annually, mainly for applications in bleaching paper. In chemistry, the term "bent" can be applied to certain molecules to describe their molecular geometry. Certain atoms, such as oxygen, will almost always set their two (or more) covalent bonds in non-collinear directions due to their electron configuration. Water (H2O) is an example of a bent molecule, as well as its analogues. The bond angle between the two hydrogen atoms is approximately 104.45°. Nonlinear geometry is commonly observed for other triatomic molecules and ions containing only main group elements, prominent examples being nitrogen dioxide (NO2), sulfur dichloride (SCl2), and methylene (CH2). In chemistry, a lone pair refers to a pair of valence electrons that are not shared with another atom and is sometimes called an unshared pair or non-bonding pair. Lone pairs are found in the outermost electron shell of atoms. They can be identified by using a Lewis structure. Electron pairs are therefore considered lone pairs if two electrons are paired but are not used in chemical bonding. Thus, the number of lone pair electrons plus the number of bonding electrons equals the total number of valence electrons around an atom. Sodium Chlorite (NaClO2) is a chemical compound used in the manufacturing of paper and as a disinfectant. 4, known commonly and respectively as chloride, hypochlorite, chlorite, chlorate, and perchlorate. These are part of a greater family of other chlorine oxides. y. The structures of condensed oxyanions can be rationalized in terms of AOn polyhedral units with sharing of corners or edges between polyhedra. The phosphate and polyphosphate esters adenosine monophosphate (AMP), adenosine diphosphate (ADP) and adenosine triphosphate (ATP) are important in biology. 4. In simpler words, an ionic bond is the transfer of electrons from a metal to a non-metal in order to obtain a full valence shell for both atoms. Perchloric acid is a mineral acid with the formula HClO4. Usually found as an aqueous solution, this colorless compound is a stronger acid than sulfuric acid and nitric acid. It is a powerful oxidizer when hot, but aqueous solutions up to approximately 70% by weight at room temperature are generally safe, only showing strong acid features and no oxidizing properties. Perchloric acid is useful for preparing perchlorate salts, especially ammonium perchlorate, an important rocket fuel component. Perchloric acid is dangerously corrosive and readily forms potentially explosive mixtures. Aqua regia is a mixture of nitric acid and hydrochloric acid, optimally in a molar ratio of 1:3. Aqua regia is a yellow-orange fuming liquid, so named by alchemists because it can dissolve the noble metals gold and platinum, though not all metals. The chloride ion is the anion Cl−. It is formed when the element chlorine gains an electron or when a compound such as hydrogen chloride is dissolved in water or other polar solvents. Chloride salts such as sodium chloride are often very soluble in water. It is an essential electrolyte located in all body fluids responsible for maintaining acid/base balance, transmitting nerve impulses and regulating fluid in and out of cells. Less frequently, the word chloride may also form part of the "common" name of chemical compounds in which one or more chlorine atoms are covalently bonded. For example, methyl chloride, with the standard name chloromethane is an organic compound with a covalent C−Cl bond in which the chlorine is not an anion. 2O, a pale greenish-yellow solid which is not explosive and is stable if kept refrigerated. 2 as a possible cathode for lithium ion batteries. In chemistry, hypochlorite is an ion with the chemical formula ClO−. It combines with a number of cations to form hypochlorites, which may also be regarded as the salts of hypochlorous acid. Common examples include sodium hypochlorite and calcium hypochlorite. Chloric acid, HClO3, is an oxoacid of chlorine, and the formal precursor of chlorate salts. It is a strong acid (pKa ≈ −1) and oxidizing agent. Sodium perchlorate is the inorganic compound with the chemical formula NaClO4. It is a white crystalline, hygroscopic solid that is highly soluble in water and in alcohol. It usually encountered as the monohydrate. The compound is noteworthy as the most water-soluble of the common perchlorate salts. In chemical nomenclature, the IUPAC nomenclature of inorganic chemistry is a systematic method of naming inorganic chemical compounds, as recommended by the International Union of Pure and Applied Chemistry (IUPAC). It is published in Nomenclature of Inorganic Mating. Ideally, every inorganic compound should have a name from which an unambiguous formula can be determined. There is also an IUPAC nomenclature of organic chemistry. Calcium chlorate is the calcium salt of chloric acid, with the chemical formula Ca(ClO3)2. Like other chlorates, it is a strong oxidizer. Barium chlorate, Ba(ClO3)2, is a white crystalline solid, the barium salt of chloric acid. It is an irritant and toxic, as are all soluble barium compounds. It is sometimes used in pyrotechnics to produce a green color. It also finds use in the production of chloric acid. 1 2 Greenwood, N.N. ; Earnshaw, A. (2006). Chemistry of the elements (2nd ed.). Oxford: Butterworth-Heinemann. p. 861. ISBN 0750633654.